Cross and Cutlass: What about those Catholics? Ever since Martin Luther nailed his 95 Theses to the door of Castle Church of Wittenberg in 1517, starting the Protestant Reformation, Catholics and Protestants have been at each other's throats! Well, not so much at each other's throats anymore but quietly dissenting the other's views. But is there so much difference between us? 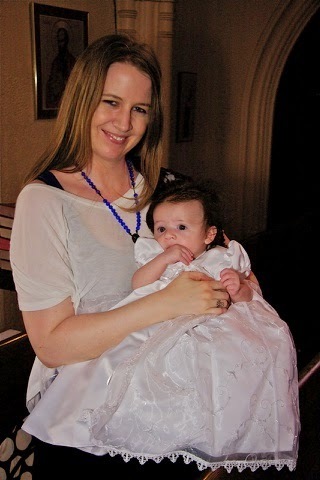 I had the privilege of watching my only daughter baptized into the Catholic church last Sunday, along with my granddaughter. I had never been to a Catholic Mass before, and especially not one done all in Latin. I hear they are rare these days, but my daughter really likes them. So, there I am, this crazy charismatic Protestant walking into this gorgeous, steepled-ceilinged stained-glass sanctuary where everyone sprinkles holy water on themselves and kneels at the edge of the pew before they sit. All totally foreign to me! I grew up in a charismatic church with lots of singing and tambourines and healings and Holy Ghost shouts. It was great! Very exciting. My church now is much more subdued, a typical non-denominational American church with the band on the stage and several lively songs followed by a sermon, etc. My experience last Sunday was one words cannot describe. The minute you enter the sanctuary, all is quiet. No one is talking. Everyone is either kneeling and praying or sitting in reverence. So unlike our modern day church where everyone comes into the church laughing and talking, drinking coffee and eating donuts and kids are running around. The reverence and awe that filled the place really touched me, and the quiet moments before the service began helped me focus on God. Then as the service began, candles were lit, bells rung, and the priest and his procession walked down the aisle carrying a golden crucifix. The choir, perched above and behind me, sang in Latin with the voice of angels as the priest stood before the altar and read the Scripture. 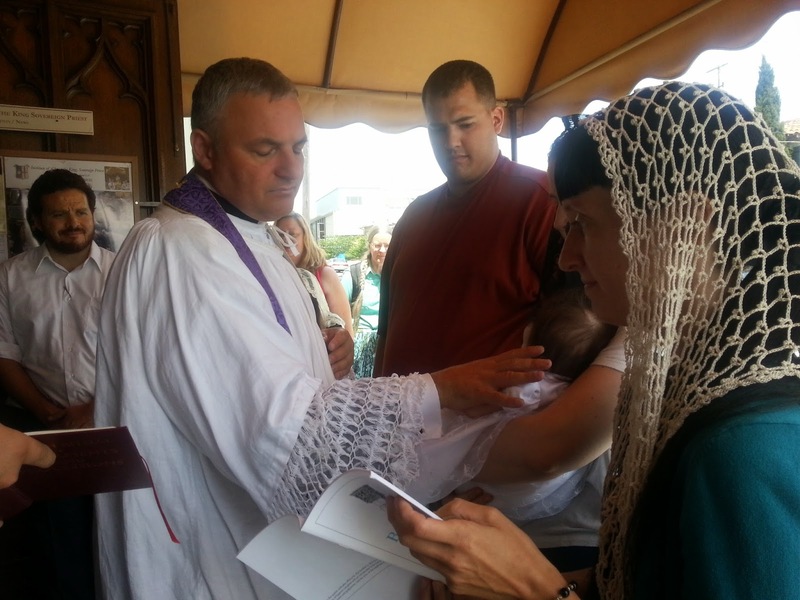 I was enthralled through the entire service, and particularly afterward when my daughter went through a 45 minute baptism ceremony, all done in Latin. It was amazing. No, I'm not converting to Catholicism. But the experience impressed upon me how irreverent our churches have become. How irreverent Protestantism has become. Do we take God for granted? Are we so enamored with His grace that we forget He is the Almighty Creator of the Universe who deserves our worship? Sometimes I wonder. Is our worship more about how great our band is on the stage, how emotionally charged up they can get us? Or is our focus on God during the music? I loved that the choir was out of site in the Catholic church. Then the focus is on God and not a performance. 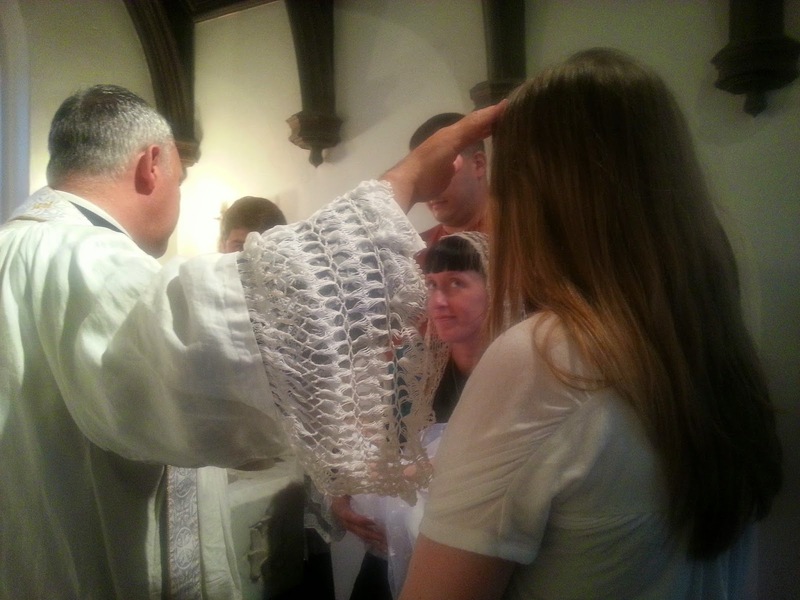 Are there people in the Catholic church who just go through the rituals yet aren't saved. Sure. Are there people in the Protestant church who just go for social reasons and aren't save. Sure. But I also believed there are many saved in both churches. I believe our modern day American churches have turned church into more of a place of entertainment than a place of worship. Such focus is placed on the experience. Our worship services are carefully crafted so that we all “feel” emotionally charged and close to God. Church services have become more focused on us than on Christ. When you take the focus off Christ, anything goes in the church service. It becomes a circus. We have lost our reverence for Christ. I respect Roman Catholics for their views on life and families. I know some very sweet and sincere Roman Catholics, whom I love dearly. But, if a person truly believes in what the Roman Catholic Church teaches, I believe they will perish. May God have mercy on us all! Interesting post! I grew up Presbyterian and always got the impression that Catholics were just wrong about everything. But I agree with what you say---although we don't have the same exact beliefs as Catholics, I think as long as they believe in the gospel, they're saved. I'm curious if you'll write about other religious groups, for example Mormons. I've noticed Mormon authors and Mormon publishers in the inspirational fiction field and wondered what Christian authors thought of that. On a side note, your granddaughter is so cute! Look at all that hair! I totally agree with you. Today's church has become all about the band, the music and socialization. If you broke down a "service" today by it's parts, you would have 25% teaching and 85% socialization. That is so NOT right. This was a very interesting post....can't see myself ever attending a Catholic service, but I do admire their respect for God's house. I SO agree, MaryLu!! I believe that anyone, regardless of church affiliation, is saved if they have accepted and confessed Christ as his/her savior. One of my very best friends has been a Catholic her entire life - I have been to a Catholic service several times as my friend never misses mass and when we go on vacation together, since there is only one vehicle - I always go to mass with her. Like you - I believe there are many saved in both churches and there are benefits to the services in each church. I do not feel that the people of my denomination are the only saved people - my friend and I are both devout in our religious beliefs, however, we respect the beliefs of each other, not arguing one against the other - but discussing the morality and political issues on which we agree. Thanks for the interesting post, MaryLu!! Love and prayers to you, and hugs to that precious baby!! Thanks for all your thoughts, everyone! I don't know much about the Mormons. I know their theology is pretty off. They believe they will each become a god someday.. and that Jesus is Lucifer's brother.. weird stuff like that. Many claim that they believe in Jesus and follow him as Lord and Savior.. but my fear is what Jesus are they following? It scares me for them because they seem to be a very devout, moral people. I agree with what you said... I would like to know where to get a chroceted veil like in the one picture... very nice. I was raised to cover for church from the age of 11 on. Linda, let me see if I can find out about the head covering. I believe the lady made it. It's gorgeous isn't it? Thank you for always writing about important topics (not just fluff). You are sensitive and wise, so your insights are very thought-provoking and helpful. I totally agree with you. I know a couple of Catholics who are truly serving God and love Jesus and are saved. I know Protestants that do and say all the "right" things, but their lives show they are not truly serving Christ and are most likely not saved. God always had in mind to be in close, personal relationship with humans He created... starting with Adam and Eve. When they broke relationship with Him, they broke His heart. He has done everything to woo us all back to a love relationship with Him ever since. We can only connect with Him through His Son, Jesus Christ--(the Mormon religion denies that)--so that's a requirement. But there are people all over the world who love and serve Jesus Christ, obey His Word, and have different cultures and styles--and we'll all be in heaven together. As a Catholic, i LIKE your post so much! God bless you, MaryLu! I think the British helped stir the animosity between Catholics and Protestants from the time following Bloody Mary and especially in Stuart England. Protestants often forget that Catholism was the church for hundreds of years. I am a Protestant. My husband is even a Southern Baptist preacher, but one of the the most faithful servants of God I've ever met took her children to live in the slums of the Philippines after her husband died so they could minister to the people there, and she was Catholic. We all need to let the love of God flow through us. Our job is to love, and judging should be left up to Him.